What's The World's Coolest Parking Spot? The sad fact of the matter is that the vast majority of a car's life is spent parked. You might as well put it somewhere cool, no? Even if driving is an integral part of your job, the amount of time you spend eating, sleeping, and otherwise stopping means that your car is stationary more often than not. And for the rest of us, for whom the car is only for commuting and free time fun, the sad truth is that almost all of its time is spent with the parking brake on. So when you must kill the engine, shut off the lights, and walk away, where's the coolest place you could possibly leave it? 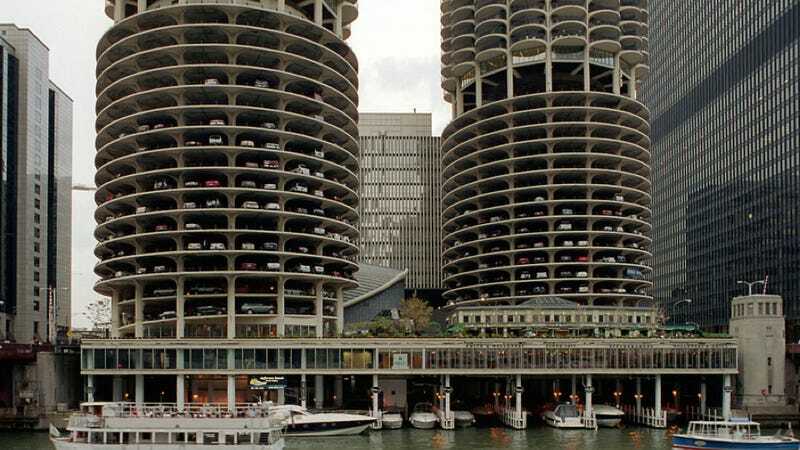 If we were parking our car, it'd have to be in Marina City in Chicago. The "city within a city" has several floors of parking garage before you reach the mixed residential and commercial upper levels. The cool thing is that the garage here is almost entirely exposed, meaning you get a fantastic view of the Chicago River. (Or, for the more paranoid among us, a fantastic opportunity to have your car fall into the aforementioned river.) In addition to allowing your car a cool view while it rests, you also get to show it off for all the passerby on the street below and the boats pulling into the complex's marina. And it's just cool architecture, if you're into that. Alas, not all of us find ourselves in Chicago at the moment (to our collective hot dog consuming detriment). Thus, we come to you, the commentariat, with today's question of the day: where are the coolest parking spots in the word? Garage, lot, or lined ditch, give us your suggestion in the comments below.